I seem to be really good at making multiple items out of the same fabric recently. Rather than have an odd metre or two sit in my stash, I've been making an effect to use up the excess to make something for someone else and share the love. 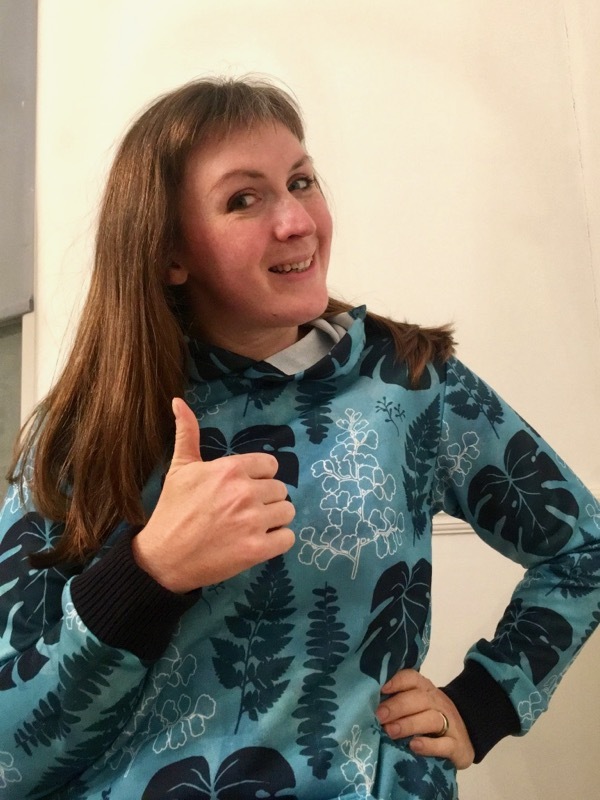 Case in point - I'd bought a few metres of digitally printed, loop-back sweatshirting from Fashion Formula using this "Turquoise tropical leaves" print design in advance of filming my my Craftsy/Bluprint "Serging Activewear" course last year. I had to sew up some of it before I flew out to Denver, then you got to see me sew a bit more of it on screen, but then it sat unfinished at home for a few months during the summer heat wave. I seem to be really good at making multiple items out of the same fabric recently. Rather than have an odd metre or two sit in my stash, I’ve been making an effect to use up the excess to make something for someone else and share the love. 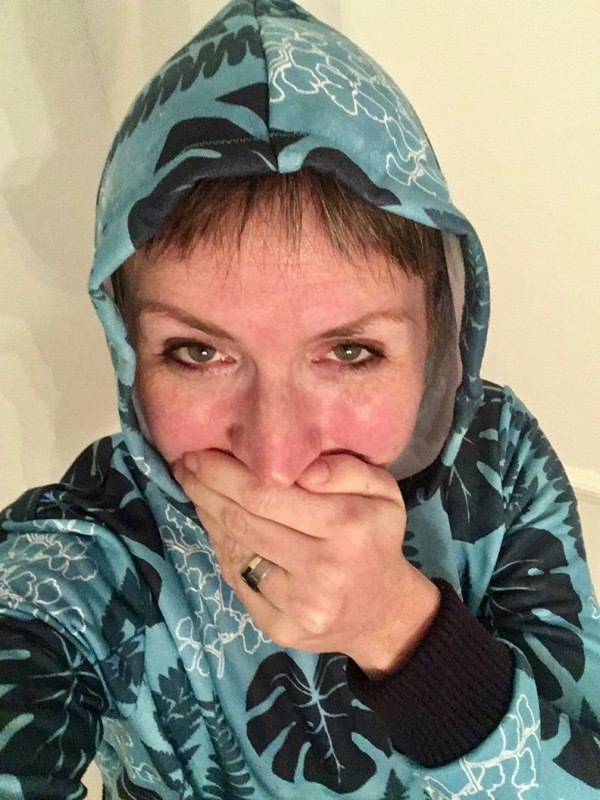 Case in point – I’d bought a few metres of digitally printed, loop-back sweatshirting from Fashion Formula using this “Turquoise tropical leaves” print design in advance of filming my my Craftsy/Bluprint “Serging Activewear” course last year. I had to sew up some of it before I flew out to Denver, then you got to see me sew a bit more of it on screen, but then it sat unfinished at home for a few months during the summer heat wave. Eventually I dug it out and serged on the last remaining sleeve cuff and hem band (yeah, that was all that was left!!) and then I had a great sweatshirt to wear, woo! We used Jalie 3355 for the class hoodie demonstrations, which, as you’d expect from Jalie, is a great little pattern. My only complaint is that the opening of the kangaroo pocket is really small, and I have a hard time jamming my hands into it since this sweatshirting isn’t very stretchy. 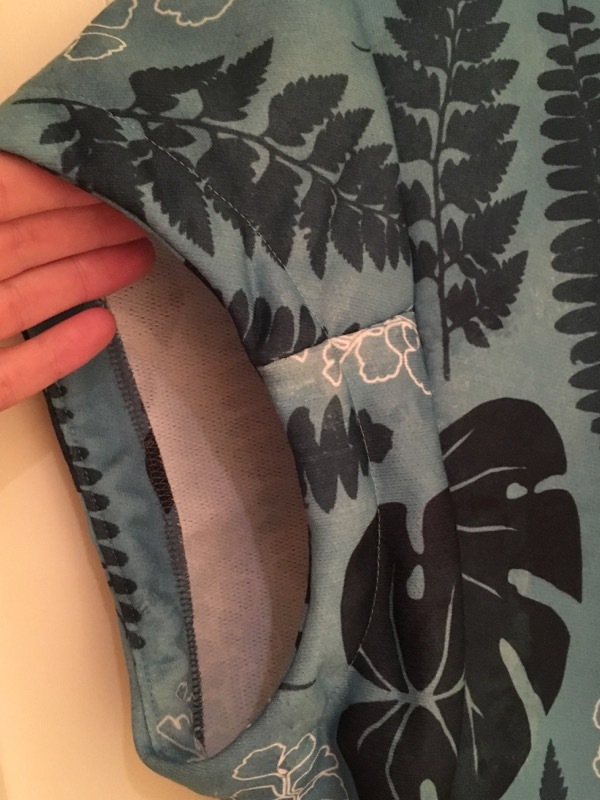 So if I’d make this again, I’d make the pocket much bigger (including a bigger opening). So then I found myself left with about a metre and a half of this luscious fabric, but since it’s just a distinctive print I didn’t really feel like I needed anything else in my wardrobe from it. But when I posted the above photos of my finished hoodie, my mom commented on how much she liked the fabric. 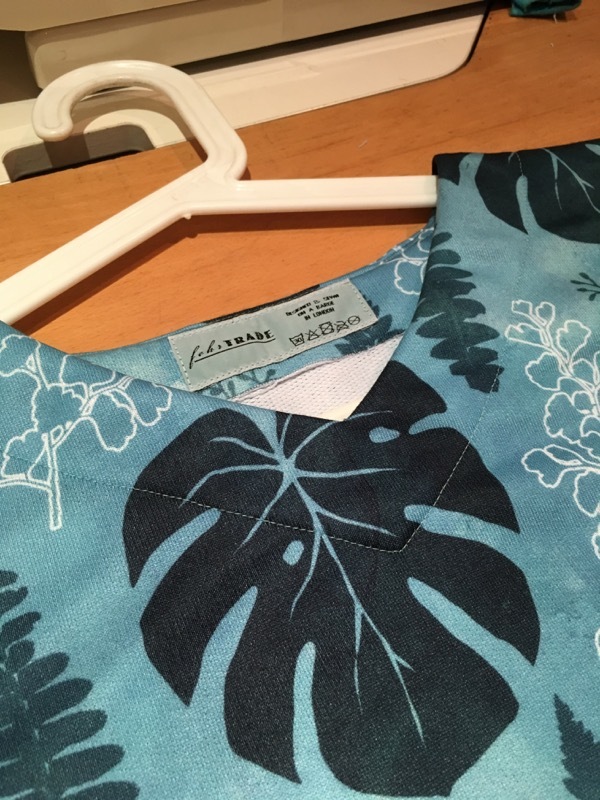 Lightbulb moment – my mom really likes my Kimono Sweat pattern, so I’ll make another one for her for Christmas using the last of this lovely fabric! Bonus points that I already had a version of the pattern cut out for her measurements so it was an easy one to sew up just before we moved out of the flat and back into the boat. I do love the detail of all the faced hems on this pattern – it’s such a high-end activewear look! 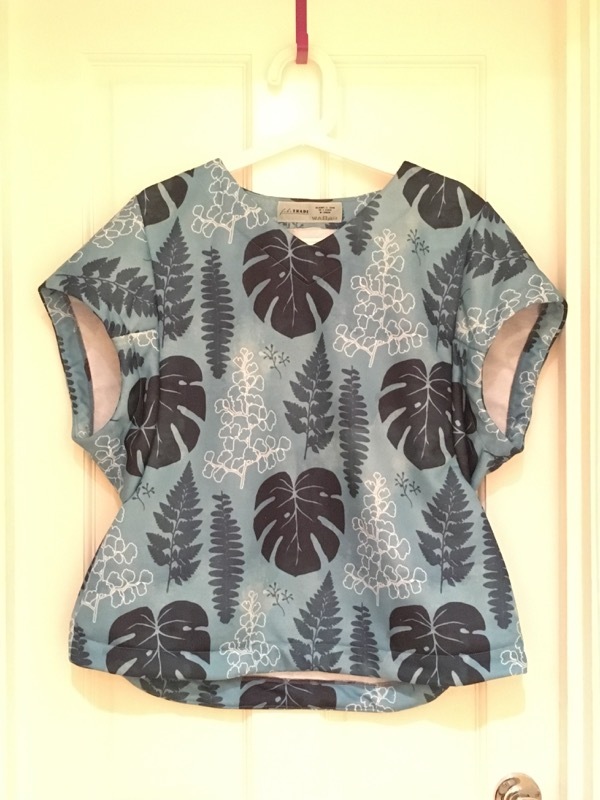 So we both get to have different tops using this beautiful, tropical print with monstera leaves and wonderful watercolour-effect details. And there’s very little chance we’ll turn up to the same event both wearing ours, too! 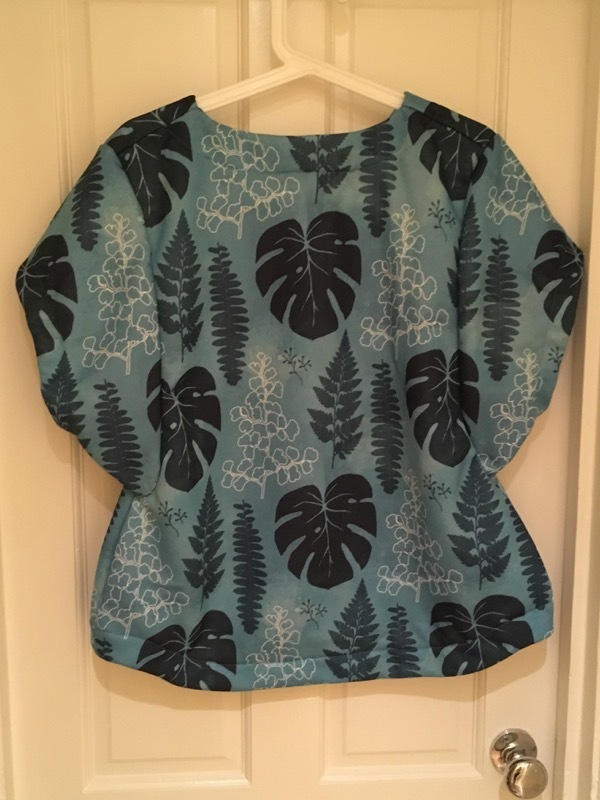 Separator image Posted in Gallery and tagged with fehr-trade-patterns, jalie, kimono-sweat, top.